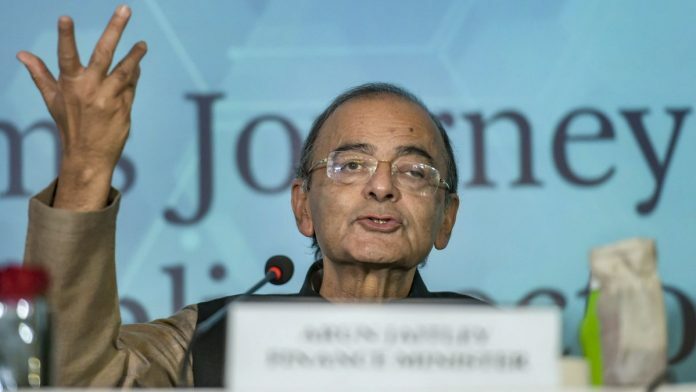 The finance minister has given a report card of the economic growth under Modi govt as compared to its predecessors. The irony of a large number of Opposition leaders is that they specialise only in politicking and sloganeering rather than understanding the world of development and economy. One of the fake campaigns against the present Government has been on the question of economic data. The Central Statistical Organisation (CSO), which handles data management, always maintains an arm’s length distance from the Government and functions professionally and independently. Our data is maintained as per the best global practices. The World Bank and the International Monetary Fund have always commented favourably while accepting our data. The recent statement by the 108 purported economists needs to be analysed. Most of them have, over the last few years, repeatedly signed the memorandums of manufactured political issues against the present Government. ‘Compulsive contrarians’ can hardly be objective. We need to analyse as to where we stand in terms of the economy. The period 2014-19 has witnessed the fastest ever growth of the GDP in India for a five year term of any Government. It has been a period of fiscal consolidation. The following chart will give the exact comparison of how the economy has performed during this period as against the earlier period. An analysis of the above table clearly reveals that the five year GDP has been 7.5 percent – the fastest amongst the major economies of the world. Inflation has been broadly under control. 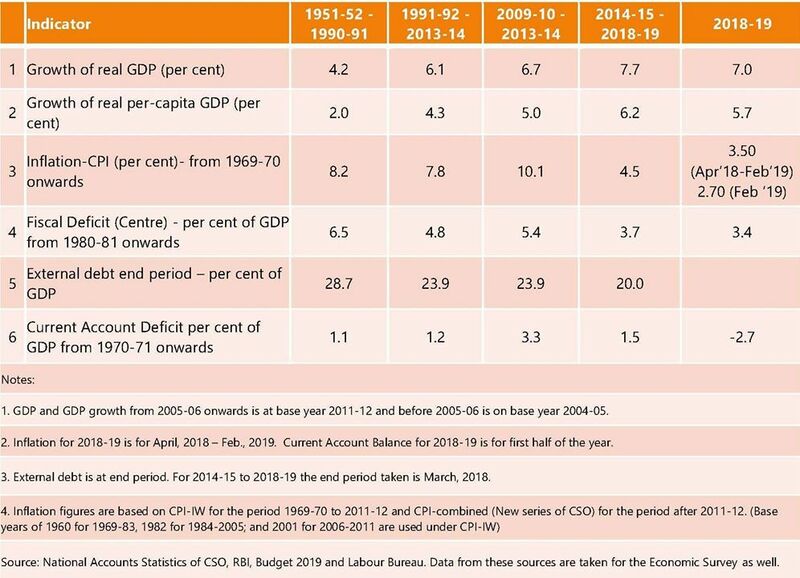 Fiscal Deficit has gradually slided down. The external debt as a percentage of the GDP is on the decline and there is significant improvement in the Current Account Balance of the Government. 1. Inflation: Inflation during the period 2009-14 was 10% plus. During the period 2014-19, it will come down to an average of about 4.5%. In fact, the last three years average is much lower. Presently it is close to 2.7 per cent. 2. Jobs: The recent survey of MSME published by the Confederation of Indian Industry in the month of March, 2019 covers 105,345 firms of varying sizes, across sectors and geographies. The survey indicates “a growth of 13.9 per cent in Net Jobs Created over the last 4 years at 3.3 per cent per annum (compounded growth rate).” The survey further states “given that the total workforce size according to the Labour Bureau is estimated at 450 million (projected for 2017-18), the overall job additions work out to 13.5 – 14.9 million per annum.” The above fits in with the trends given by the EPFO data by S.K. Ghosh and Pulak Ghosh. All these data indicate the general trend of jobs increasing in India, which match the 7.3 per cent average growth rate of GDP. Normally a high growth rate leads to a higher job creation. This can be negated only if the productivity levels suddenly grow up. In India, it is unlikely. There is no social dissatisfaction in terms of popular agitations or protests. Thus, the fake campaign of job losses in India deserves to be rejected. If we consider the rate of growth of GDP, investment in infrastructure and accompanying economic & labour reforms for the last five years along with the underlying structure of the Indian Economy, it would be amply clear that there have been several sources of employment growth and creation of gainful employment opportunities. MoSPI has been bringing out employment related statistics using payroll reporting. EPFO data shows that 72.32 lakh new subscribers were added to EPFO between September, 2017 and December, 2018. This would not be possible without an increase in jobs in the formal sector. This is corroborated by a study by Mohandas Pai, which calculated that 1.08 crore jobs have been created in just three professions – CAs, Lawyers & Doctors in 2017. The faster pace of constructions of National Highways and rural roads under PMGSY are estimated to have generated 178.8 crore person – days of work (as per an IIT, Kanpur Study). New entrants in the e-commerce and technology space like Uber, Ola, OYO etc have generated a large number of direct and indirect employment activities. About Rs.7.99 lakh crore have been sanctioned under MUDRA, out of which 28% loans are to new entrepreneurs. It would be preposterous to contend that the fastest growing economy in the world is actually losing jobs and that even the 17.1 (as on 19.3.2019) crore Mudra loans created no jobs through self-employment. 3. The Insolvency and Bankruptcy Code: It is estimated that in the last two years about three lakh crore of NPAs have been recovered on account of enactment of IBC either through the IBC process or through the pre-IBC provisions. The ability of banks to support growth has increased. The amalgamation of banks is giving way for stronger lending institutions. 4. Some Social indicators: The LPG coverage across the nation was 55 per cent in December, 2014 and had increased to 93 per cent (as on 8.3.2019). Ayushman Bharat has provided hospital healthcare to 10.74 crore families totalling about fifty crore beneficiaries. Rural sanitation has increased from 39 per cent in 2014 to 99 per cent as of today. 5. Infrastructure indicator: Rural roads were built in 2013-14 at 69 km per day. It has increased to 134 km per day in 2017-18. The same is the position with the National Highways, where today 25 km per day i.e. more than 10,000 km a year are being built. Currently the Metro service operates in 14 cities and its length is 645 km. India’s first High Speed Rail will be completed in 2022-23 covering a distance of 500 km between Ahmedabad and Mumbai. India’s air traffic in the last four years has seen the largest ever growth. Today we have 102 functional airports. We have moved towards near total rural electrification. The construction sector, which traditionally creates significant jobs, is growing in double digits. Yet, if the critics are to be believed, this growth did not create jobs. 6. Electronics manufacturing: The Indian electronic sector has made significant advances in the last five years. From Rs.180,000 crore manufacture of electronics in India pre-2014, we have now touched Rs.3.87 lakh crore of manufacturing. The five years of the NDA Government will see the growth of the electronic sector close to rupees five lakh crore. From almost a negligible manufacturing of mobile phones in India in 2013-14, today we are the second largest producer of mobile phones in the world. An incredible contrarian data shows that this did not create jobs. 7. Ease of Doing Business: From a low of 142 in 2014, our ranking in the first four years of the Government has improved to 77. This is the fastest ever growth of 65 places in our ranking. In areas such as, ‘Construction Permits’, we have improved our rank by 129 places. In ‘Trading Across Borders (customs)’, we have improved 66 ranks. We have similarly improved in other areas such as ‘Starting a Business’, ‘Getting Credit’, ‘Getting Electricity in a Country’. We still need to improve under certain sectors such as ‘Enforcement of Contracts’. 8. Rural Infrastructure and Agriculture: Today India spends Rs.1,84,000 crore on the Right to Food for the poor people by providing them subsidised food. India spends Rs.75,000 crore in income support to our farmers. It further spends Rs.60,000 crore on the Rural Employment Guarantee, the highest ever. We have tripled the expenditure on rural roads. We have made substantial headway in rural electrification, sanitation and cooking gas. On healthcare, through Ayushman Bharat, we have launched the largest and the most successful healthcare scheme for the poor people. We are supporting farmers with over rupees twelve lakh crore of credit, interest subvention, subsidised crop insurance, subsidised fertiliser and seeds and increased MSP and income support system. I believe that these measures when combined with enhanced investments in rural India over the next ten years will help us to bring the quality of rural life closer to those in the cities. I have given some details of economic development in India over the last five year using empirical evidence. The evidence clearly shows rapid progress in the economic fortunes of all Indians irrespective of caste or creed. Only those who failed to develop the Indian economy despite being in power for several decades cannot witness the reality that is staring in their faces. The whole world, including the IMF and the World Bank, regard India as the fastest growing major economy in the world. The 130 crore Indians believe it. Only the ‘compulsive contrarians’ don’t! how well explained Mukesh! Unfortunately,most people are very myopic when it comes to this Government. Another factor people wont consider is that Maruti has been showing double digit growth consistently every year for last 4 years. In its 5th year, it is cutting production by 27% – that still is a net positive for last 5 years!! First obtain permission from your Daughter & sonin law. Mr. Jaitley you can’t fool anymore ‘ janta ki Adalat main decision ho chukka. Sometimes a swallow is needed to judge the onset of summer. Maruti has cut its production by 27%, for the first time in thirty years. Simple answer for you, Maruti was the dominant player since long, increase in number of other players in Indian market leads to reduction in their market share…..